Ta da da new flowers are in sneak peak below. There are way more in store then this little image – we now have a white section at the back of the store (think roses, big fat headed peonies, apple blossom, wisteria on and on I could go) as well as this section below. 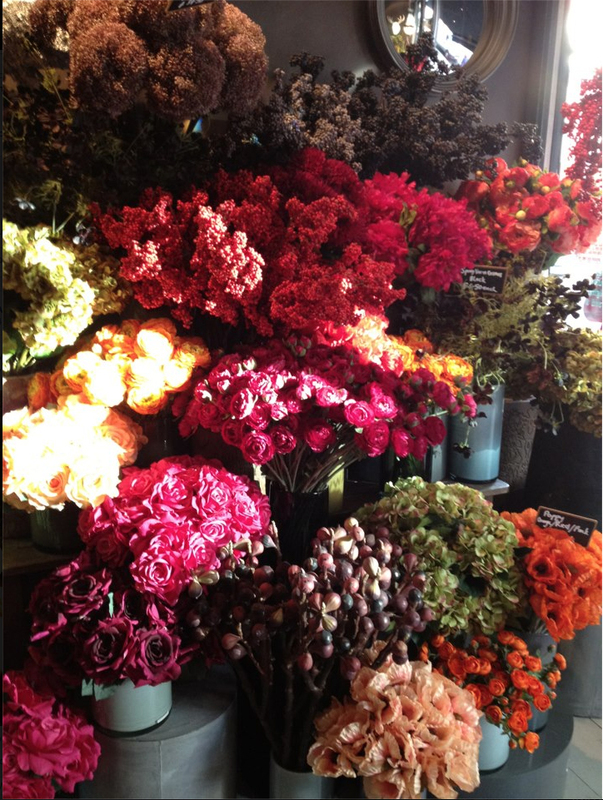 Flowers in the most tantalising of hues, bright pink roses, burnt orange ranunculus , berries in the most beautiful wintery hues. I am biased I am sure but the store has never looked so beautiful. The guys will take more images over the next few days – what we thought would be a few hours turned in to over 12 hours but worth it truly worth it. As a result my schedule is all over the place hence the 5am wake up call, never mind nothing that a few coffees won’t sort out I am sure! Time for some wise words. I was reading the blog the design files recently and there was an interview with Amanda Talbot (very talented lady, author, stylist, TV presenter) along with some images Amanda styled (see below). 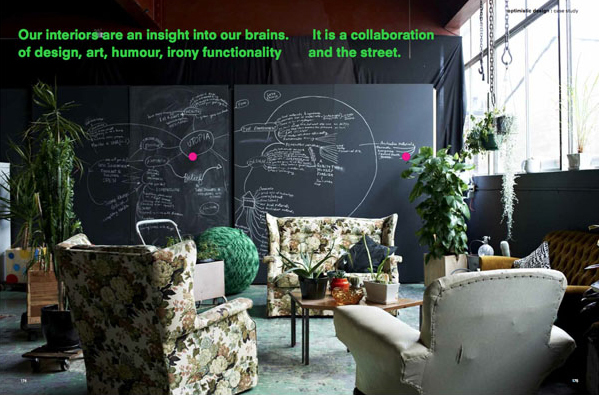 This sentence ‘our interiors are an insight into our brains. It is a collaboration of design, art, humour, irony, functionality and the street’, totally and utterly nails what a home should be, at least in my book. Yes we need it to be functional and practical but if it doesn’t lift the spirits when you walk thru the door, if it doesn’t wrap you in the biggest thickest most snuggly blanket, then whatâs the point I say. You don’t need oodles of cash to pull it off, you just need to believe in yourself, and push yourself – the more you push the more interesting your space becomes. Co-ordination, harmonisation and balance are all good, but they need to be shaken up a little with something oddball, piece of furniture, art, cushion you name it, especially for those of us with winter on the way we spend longer indoors than out so its vital our homes tick all those boxes from that sentence above. I think what holds people back withÂ interiors is confidence, what happens if you go wrong, what happens if say the paint colour you’ve deliberated over for months just doesn’t work out. Don’t worry about it, don’t let it hold you back, if you go wrong you go wrong. I do all the time, you just need to get back on the horse. Onwards and upwards, we have one shot at life make it the best you possibly can I say! Right then I need to get on things to do, have a lovely weekend – on my agenda a new car, its a sad thing to say but I can’t deal with the merc anymore I just want to get in a car turn the key (not wait 20 minutes for it to warm up) drive for 5 minutes without breaking down and if we get the car this weekend find the hugest, tallest hill in London and zoom up it. Our 1968 Mercedes doesn’t do hills so for over a year I haven’t driven up one and I have an urge to!